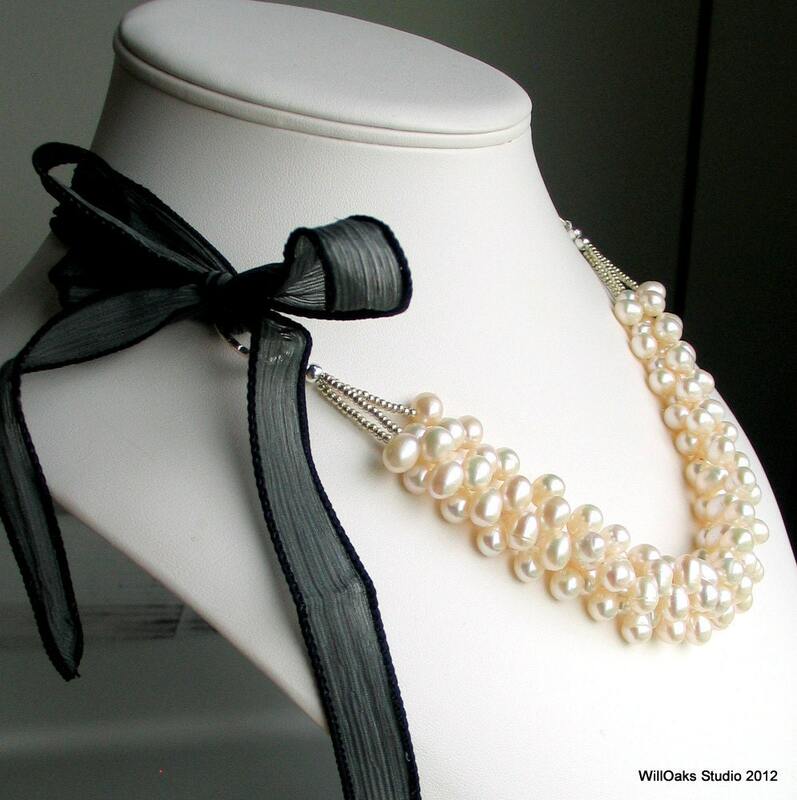 Three strands of larger white freshwater pearls create a rich cluster as a focal point with silver accents and a black handmade silk ribbon. The black ribbon allows this multi strand bib to be adjusted for the perfect length, so it can be worn as different looks with different necklines. 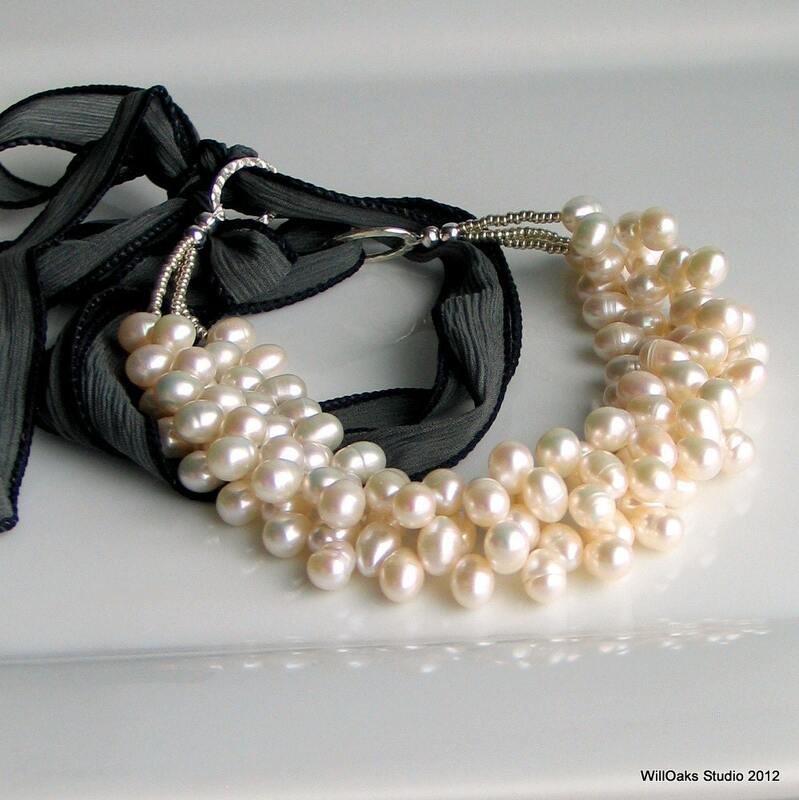 Perfect for a bridal accessory, as part of wedding fashion, as a deluxe gift, or just a contemporary version of a classic white pearl necklace. A statement necklace that is elegant and romantic. The multi strand focal point is 11" long. 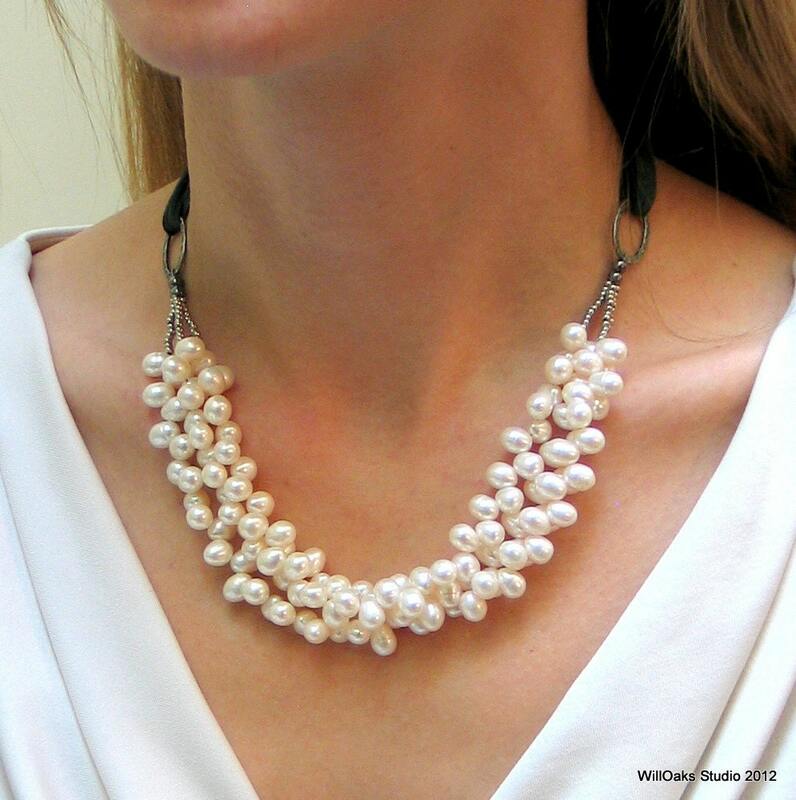 Each pearl strand is linked with silver Czech glass beads to a textured, silver finished metal oval. The ribbon can be knotted, tied in a bow and positioned where you prefer, or interchanged with other colors of ribbon or fiber. 10 mm x 7 mm top drilled, rice shaped pearls create a lovely cluster that hangs down about 1 1/2" center front. The freshwater white pearls have a beautiful luster. 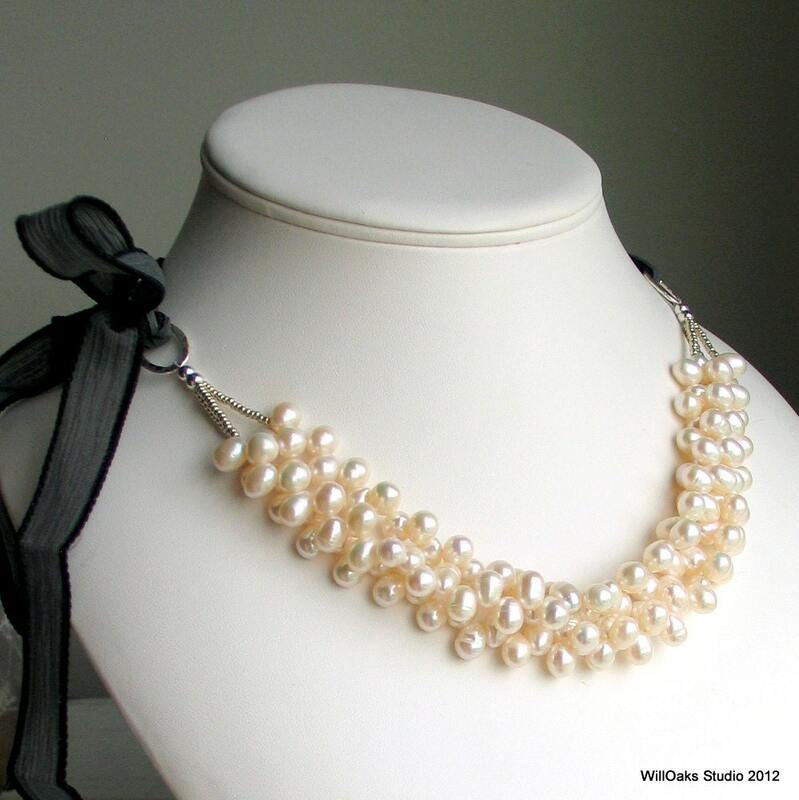 This design is also available with metal parts in an antique silver finish as a separate listing here in my studio here https://www.etsy.com/listing/98562798/white-pearl-bib-cluster-on-silk-ribbon? I have a wide range of ribbons available and can possibly help you with a color that will best suit your outfit--please drop me a note with your needs. 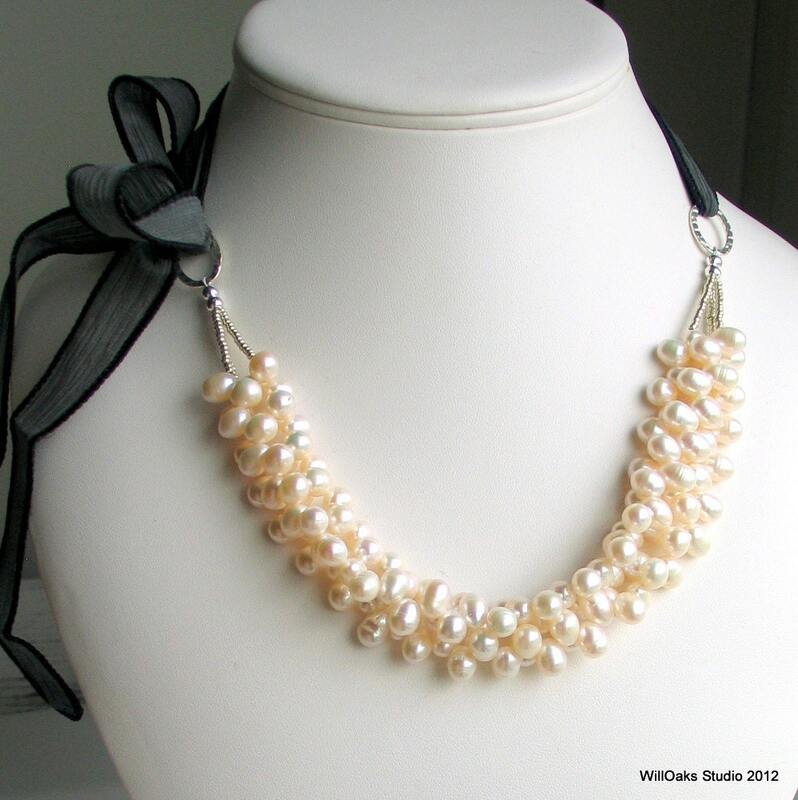 White pearls are such a classic, and my design is classic, too, but with a contemporary artisan update. Suitable for business, formal and casual wear, easily adaptable for wedding wear. I began to develop this bib design structure for pearls several years ago. Earlier versions used silver chain, crocheted silk chain, and beaded "chains" to hold this multistrand cluster of pearls. Then I discovered and began to use artisan dyed handmade silk ribbons to secure them. I love this approach because the "cluster" can be beautifully worn at different lengths from a higher choker to a longer opera length. Since the handmade ribbons are around 37-40" long, when used double and tied in a knot or a bow, there are many different looks that can be achieved with these pieces..
Karen, These necklaces are gorgeous !! Stunning work !! Can't believe you made them while incapicitated! Thanks so so very much and for extra ribbon !!!! The necklace is absolutely stunning! I know I'll be wearing it often. The pearl earrings are a perfect complement. Fast shipping! Thanks so much! Karen was really great to work with. I wanted a different color ribbon for this necklace and she was able to accommodate my request. The finished piece is gorgeous. I know my future mother-in-law will love it! Thank you!